RetroGamerNation has revealed the results of the recent Amstrad Gamers' Choice Award 2018 poll on YouTube. Nice to see that the top three games reflect my choices as well, albeit not in the same order! I've added links to videos on GameHammer Classic Gaming's YouTube channel on my site. This channel is run by Zoë Kirk-Robinson and it features a variety of videos, including occasional reviews of Amstrad CPC games and multi-format comparisons of games, similar to the ones you'll find on ChinnyVision. Vintage is the New Old and Retro Video Gamer are running a poll called the Amstrad CPC Gamers' Choice Award, to decide the best Amstrad CPC game released in 2018. Thirteen games have been nominated, and you can vote for your favourite three games. The vote closes at 23:59 GMT on Monday 25th March 2019. PuzCPC has converted Konami's 1981 coin-op game Scramble to the CPC. 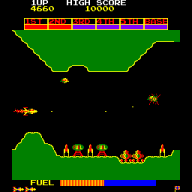 For those who don't know, Scramble is a horizontally scrolling shoot-'em-up in which you fly along a landscape shooting aliens and frantically bombing ground targets, missile launchers and fuel tanks in an attempt to stay alive for as long as possible. PuzCPC has spent ten months programming it and it is amazing just how faithfully it has been reproduced on the CPC! You can download Scramble from the CPCWiki forum. The reception from CPCWiki forum members has been overwhelmingly positive, and if you haven't tried it already, I'm sure you'll love it too. Novabug, in collaboration with Indie Retro News, has uploaded a YouTube video which contains an exclusive first look at the full version of Pinball Dreams, with footage from all four tables. It looks amazing! Batman Group has tweeted that the Amstrad CPC version of Pinball Dreams was finished in November 2018 and they are negotiating with Rebellion, who hold the intellectual property rights to the game. Keep your fingers crossed that an agreement will be reached and we'll see a full official version of Pinball Dreams for the CPC soon! A preview version of Pinball Dreams with one table (Beat Box) was released in late 2016, and if you've yet to try it, you can download it from NVG. 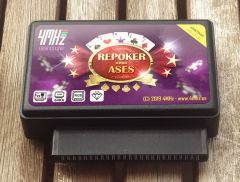 4MHz are planning to release a unique product for the CPC – a compilation of five of their games on a single cartridge that plugs into the back of your CPC! The good news for CPC464 owners is that all of the games are now compatible with machines with 64KB of RAM; some of the games originally required 128KB of RAM. The cartridge is limited to 150 units, and if you place an order by 28th of February, it will cost you €39.95 (excluding shipping). After this date, it will cost €45.00. 4MHz has stated that everyone who places an order before 28th of February will have their names included in the main menu and the instruction manual. Jordi Sureda and Santi Ontañón released Phantomas 2.0 on the 1st of February. It's a remake of Dinamic's 1986 release Phantomas 2, which British readers will know better as the Code Masters release Vampire. Phantomas 2 is regarded as a classic in its native Spain, but the Amstrad CPC version looked rather ugly and Spectrum-like. 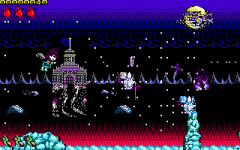 Phantomas 2.0 features improved graphics using the CPC's high-colour, low-resolution MODE 0, and several tunes are also included. 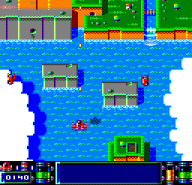 The control method has also been altered; the original game enabled you to jump in two different ways using two different keys, but to simplify the gameplay, only one key is now used to control the extent of your jumps. You can download Phantomas 2.0 from Santi Ontañón's GitHub page, and physical cassette copies are also available from Matra for €8.75 (excluding shipping). 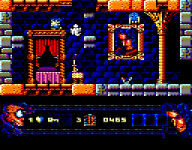 ESP Soft has released a playable demo of their forthcoming game Red Sunset as a Christmas gift for Amstrad CPC fans. It's a vertically scrolling shoot-'em-up in the style of 1942 or Flying Shark, with the action viewed from an overhead perspective. You can download Red Sunset now from ESP Soft's site. Merry Christmas! 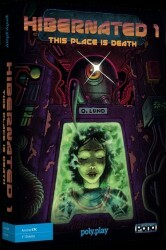 The highly acclaimed text adventure Hibernated 1: This Place Is Death can now be pre-ordered from poly.play. The CPC version can be purchased on cassette or disc, and if you buy the cassette version, you'll also receive the ZX Spectrum version on the other side of the cassette. The package will also include goodies such as a poster, patch and stickers, and you'll also get a bonus game called Eight Feet Under (and the author, Stefan Vogt, has tweeted images of the beautiful title screens, drawn by Railslave). Hibernated 1: This Place Is Death costs €20 for the cassette and 3½″ disc versions, and €25 for the 3″ disc version (excluding shipping). Sadly it isn't expected to be available until mid-January 2019. If it had been released during December it would have made an excellent Christmas present. Missas has reviewed Black Land. I've changed the links to the NVG archive site so that they now use HTTP instead of the older FTP. This should make it quicker to download the ZIP files when you click on a game's title. As you can tell, 4MHz dominated the awards with Operation Alexandra, receiving €705 in prize money, and it's a deserving winner. You can download all 41 games from the #CPCRetroDev website. As with the previous competitions, I offer my congratulations to all the winners! Keith Sear released version 1.666 of his bullet hell shoot-'em-up Chibi Akuma(s) a couple of days ago, in time for Hallowe'en. The game received a rating of 10 out of 10 on this site, and further improvements have been made. The game now uses the improved engine that was used in the sequel, Chibi Akuma(s) Episode 2: Confrontation! ; a 2-player option has been added; there are additional background graphics, and if you have a Plus machine, the game makes much more use of its enhanced 4,096-colour palette. You can download Chibi Akuma(s) from the official site, and you can also buy a physical copy from poly.play for €20 for the 3½″ disc version, or €25 for the 3″ disc version (excluding shipping). I've already bought my copy and the packaging and artwork are lovely! Missas has reviewed Mike the Guitar. Some of you may know of the game The Trap Door by Piranha, based on the classic animated children's TV series. It turns out that a bug exists in the Amstrad CPC version of The Trap Door, which makes it impossible to complete the game – and for 32 years, it seems to have gone unnoticed. One of the tasks you have to complete is to prepare 'boiled slimies'. You do this by putting the slimies in a cauldron, and releasing a green robot-like monster from the depths of the Trap Door. 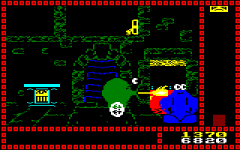 What is supposed to happen (and which can be verified by watching walkthroughs on YouTube of the ZX Spectrum and Commodore 64 versions) is that the robot can be made to breathe fire on the cauldron and boil the slimies – but on the CPC version, no matter how many times the robot heats the cauldron, the slimies remain uncooked. I will not bore you with the technical details, but after a lot of digging in the code, I have fixed the bug, so after 32 years, The Trap Door can now finally be completed on the Amstrad CPC! You can download the fixed version of The Trap Door from NVG, and there is also a discussion on the CPCWiki forum which prompted my decision to create a fixed version. YouTube user Novabug has wasted little time in creating a walkthrough of the Amstrad CPC version, which you can watch below. Missas has reviewed Xifos' 2018 remake of Ghosts'n Goblins. I have reviewed Behind Closed Doors Seven. This is one of two text adventures that have recently been released by Zenobi Software for the CPC (the other one being Ramsbottom Smith and the Quest for the Yellow Spheroid). Zenobi Software is much better known in the ZX Spectrum community for its huge catalogue of homebrew text adventures, so it's great to finally see a release for the CPC 32 years after the company's first ZX Spectrum release.